I’m excited to have this quilt finished and ready to show to you! I had a chance to work with some of Laurie Wisbrun‘s upcoming line for Robert Kaufman, Brrr! The line features Laurie’s super cute polar bears in two colorways along with great coordinating prints. You could make really wonderful wintery items with this line (and I’ll have a little something wintery to show you soon! ), but I wanted to show how they could be incorporated with your other fabrics for a great year-round quilt! I paired these great prints with some of the circles from Laurie’s Modern Whimsy line (a great basic!) and a few other basics from my stash. You can find the tutorial for my Converging Corners block here, in case you should want to make one of your own. I made one large converging corners block for the backing, and often happens, I’m quite taken with the backing, maybe even more than the front? For the quilting I tried to channel a bit of Angela Walters. I had the opportunity to get a sneak peek at her new book, Free-Motion Quilting with Angela Walters, which will be available in the next couple of months. It’s a wonderful book – I read it cover to cover and immediately wanted to quilt something. I have been feeling a bit tired of the usual meandering, so it was great to read Angela’s idea for other free motion quilting patterns and ideas. In quilting this quilt, I opted for a bit of a cross between a floral pattern Angela described in her book and a favorite Marimekko sketchy floral pattern. I quilted a large scribbly flower right in the center of each of the converging corners. I wanted to go all Angela Walters on this and add in a second design in the open squares, but after attempting it and having to rip it all out, I ended up going with the same floral design but on a smaller scale. I hope you can see a bit of it in the close-up photo above. Unfortunately, after a wash, the floral pattern is less obvious, but gives this quilt great texture. I’ll definitely be attempting this design again! It’s all bound in my favorite Kona Cerise and measures about 45″ x 55″. And now, how about a giveaway? Would you like a chance to win these fabrics before you can even buy them? Laurie Wisbrun and the kind folks over at Robert Kaufman have sent along a fat quarter stack of the entire line for one lucky winner. Please just leave a comment on this blog post (as always, one per person, please!) to be entered to win. I’ll select a winner on Friday! Update: Comments are now closed. I’ll select and announce a winner shortly! This entry was posted in [search] Other Quilts, Fabric, Quilts and tagged angela walters, book, Brrr!, converging corners, free-motion quilting with angela walters, handmade, laurie wisbrun, modern, modern whimsy, polar bears, quilt, quilting, robert kaufman. Bookmark the permalink. a giveaway winner and a perfect new pillow! Would love to win theese beautiful fabrics 🙂 Love the pattern to, and I have started a quilt with owls in center og nice colorfull fabrics in converging corners. The quilt is wonderful, love it. Thanks. I think it is a wonderful quilt and thank you for the giveaway. I looooove this fabric line. 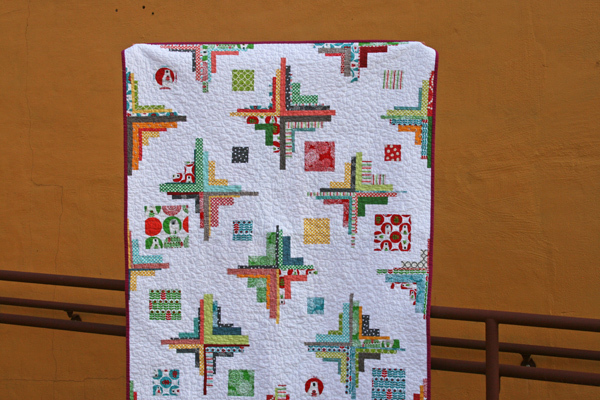 i love this quilt – so fun the way the crosses come together in various colors! LOVE Laurie’s new line – that turquoise polar bear print is so great! I love the colors in her new line. They look cool & wintery (I live in Florida & it is already beginning to feel like summer here). Beautiful Quilt Ashley! So great to see this fabric worked with non-christmassy stuff too. Gorgeous quilt and great fabrics! There are no polar bears in Connecticut that I know of either… Unless I win the giveaway… Thanks for the chance! The quilt is just utterly gorgeous. I so love this design and the quilting is inspired. As to the fabric bundle – who would not want this precious pile? Gorgeous quilt, and the fabric is wonderfu. I love those polar bears! Love the quilt! Those polar bears are the best! I just love this quilt. Great job with the quilting–can’t wait for Angela’s book to be released. I woke up to 2 inches of snow this morning, seems appropriate to see your quilt with cute little polar bears! I really love this fabric, and I’ve been searching for something to make a winter-time throw. This would be perfect. I really love that quilt, both this exact quilt and the design features. Love. I really like that converging corners design, Ashley! Your tutorial is very clear. Would love to have this new line of fabrics. Thanks! P.S. LOVE your blog – so inspiring! Wow…the back of the quilt is just as pretty as the front! Love the quilting on it too! Thanks for the chance to win too…I do love red and aqua together! Your FMQ adds great texture to this quilt and looks fantastic. I haven’t mastered FMQ yet-still sticking with straight line-but know that I need to jump in the water and try it. Brrr.. I really like your quilting idea. Looks like a good way to practice free motion quilting. I always stress out over making my stippling not have pointy corners, this way it’s o.k.! Thanks to all of you for the giveaway. thanks for the givaway it is great ,your quilt is gorgeous !! wow you are so clever, it is gorgeous, what more can I say? Oh I’d love to win a bundle of this fabric please! This looks great! I love they way your paired the fabrics with the warmer yellow print. What a beautiful quilt! Red and aqua just feel so Christmassy to me and if I started now I might actually get a quilt finished by Christmas… Thanks for the giveaway and the inspiration! oh yes, pretty please! your quilt backings are always so stunning, isn’t it great when you can get 2-4-1 on a quilt and have it both sides up on the bed? Love,love,love this line! Love how you chose to quilt your top. Brrrr! A little bit of winter from the winter that wasn’t! Love it! And I’m excited to do some converging corners for myself! Oh wow! What a stunning quilt- back and front! I have only quilted a few times but am so inspired by others.. would love to win! I love this quilt, and the fabric is gorgeous! I can just see it as a quilt for my nephew in chilly old South Island, New Zealand! Wow! I really like Converging Corners. Also, thank you for the inspiration to try something new with my quilting outside straight line. Your quilt looks great! I am so excited for this fabric to be released – it is the cutest!! Thanks for the chance at seeing it a little early! I love these fabrics! Perfect for a winter baby or a winter quilt that doesn’t scream “Christmas”. Thanks for sharing! Oh, I would sure like to win that fabric! I love the icebears and the red and aqua combination. Thanks for the giveaway! Such a unique quilt and I love the fabrics! This quilt is amazing! I really want to attempt it at some point! Thanks for the opportunity for a giveaway! Love this quilt! And seeing your FMQ inspires me to try something new. Beautiful quilts, as all your quilts by the way. That is a freakin’ awesome quilt…as usual! Great giveaway too. Thanks. Love the quilt design (and these fabrics)! Oh my gosh, along with the new Sweetwater lines coming out this is the only holiday one I’m waiting for! I love the Scandinavian influence (in my mind) and the bears are awesome!!! Great quilt! Love Laurie Wisburn fabrics! Always quite surprising and bit retro in color and design. So, what a great chance to win a FQ bundle! I’ve seen these prints everywhere! I need them! Love those polar bears!!! I’m a bear collector, so I’d be thrilled to make a quilt with those fabrics. Thanks for the chance! What? No Polars in VT? I thot that state had everything. Well, it has a really cute quilt now. Thx for the chance to win some of that great fabric. Red, aqua and polar bears–how can it miss? Thanks for the giveaway. Such a great quilt — and I LOVE those fabrics! Thanks for the chance to win a bundle! Such a cute quilt! I’d love to win some of that fabric!!! Awesome inspiring quilt. Thanks for the opportunity to win some great fabrics. I’d love to win more fabric! The polar bears are cute! Love the one large corner block on the backing! Great idea! I love this quilt! And the fabric is adorable. My daughter’s favorite animal is polar bears so I’d love to get my hands on some! LOVE that converging corners quilt! Beautiful work!! I can’t get enough of the red and turquoise – what a fun grouping! First off, I love the converging corners pattern and can’t wait to make one. Secondly, I love that you made the quilt with a year round feel instead of just wintry. you always come up with the most creative ways to show fabric! inspired! I’d love to win, these fabrics are so cute. And your quilt design, wow I love it too. Thanks for the giveaway! This is my current favorite of all your quilts. Thanks for the chance – it would be great to win! I just LOVE this quilt and the fabric, would love to make it into a twin size for my grand daughter. Thanks for the Giveaway! Love, love, love your quilt!!! Ohhh, I have been coveting this line since I first saw pictures! Thank you for the chance!! I love your blog . You inspire me to try new things ! Love the colors and the quilting. Yay for another giveaway. Thanks! I love your new quilt, looks very cozy! I would love to play with those polar bears. Thanks for the chance to win! Your quilts are my absolute favorites! Fun quilting! I am going to have to try that one! Your quilt is fantastic!!! Love the design! Any possiblity of a pattern in the works? I’ve already started a converging corners baby quilt based on your tutorial as i fell in love with it- thanks for sharing it. The quilt looks amazing. Fingers crossed! Wow, combining those prints with other fabrics give them a totally different look! Very nice. Thanks for the chance to win. WOW! Beautiful quilt and fabric. Would love to win this and start my very first quilt! Thank you! Love your quilting! That quilt is gorgeous and so is the fabric. Can’t wait to get my hands on some Brrr! Thank you for the opportunity to win some. I love how the backgrounds you choose showcase your quilts so perfectly, but I don’t think the llamas can be topped. This is a great quilt and the quilting is perfect – love the converging corners idea and the fabrics. Love, love, love this line! The designs, the colors -really fun! This quilt is so pretty! Thank you for the chance to win! LOVE the finished quilt. The colors really pop against the crisp white, and the little bears are so cute and happy! Lovely quilt and beautiful fabric! I hope I win! such a great quilt and such a great giveaway. thanks for the opportunity to get hold of some Brr! I’m with you, I like the back almost as much as the front. Beautiful quilt! Here in South Africa summer is coming to and end 🙁 so it is time to start to get the winter woolies out. I would use these cheerful fabrics to make a quilt for my very good friend Paula, who very sadly had a car accident 2 weeks ago which has left her paralysed. This quilt would show her how much we love and support her. I really love this pattern and the quilting looks awesome! Way to go! Thanks for the chance. I’ve been admiring the brrr line for a while now – thanks for the chance to win! How cute are those fabrics. Awesome! Thanks so much for your tutorial – I have really enjoyed watching this quilt’s creation! Thanks, too, for the chance to win some frosty Brrrr fabric!! Love that line!! Great use of an amazing fabric, and love the converging corners! Thanks for the giveaway and the opportunity to try this fabric. I would love to win. I used to work in Burlington so I always enjoy seeing the sites where you photo your quilts. This quilt is one of my new faves! Would love to make one of my own! Those fabrics are just delicious. I love the quilting on this one! So lovely! Wow, what a gorgeous quilt. But as per usual your eye for color and pattern is perfect. These fabrics are adorable. I have been planning a red and blue quilt for ages, fingers crossed I could use these lovely Brrr fabrics for that. thanks for the chance to win. I just love the color combination. Thanks for the giveaway! This fabric is cute and fun! Love reading your blog…your projects are inspiring, and it is so great that you are a fellow vermonter. It is snowing at my house in East Montpelier right now….brrr. Your converging corners is a gorgeous design and I’m hoping to attempt one of my own in the near future. The quilting you have done on this one looks fantastic! I’m anxious for the Brrr fabric line to be released. Thanks so much for offering a giveaway! Fantastic job with the quilting. Isn’t it fun to try new things? Thanks for the opportunity to win a little stack of these lovelies. So lovely, thanks for the change to win! LOVE your quilt! Would love to win this gorgeous fabric-thanks! The quilt you showed is beautiful! Thank you for the giveaway and the alert about Angela’s book. I didn’t know she has something in the works. I love the quilt and the bears! This pattern is really fantastic, and I love the contrast of your free motion flowery scallops. Another great finish! Your quilt is beautiful — and I love the quilting on it! Thanks for a chance to win this gorgeous fabric! I really like the print with polar bears in polka dots! Love the quilt, especially the quilting! Thanks for the giveaway! love your quilt. Thanks for the giveaway! Those polar bears would love to come and play at my house! Love your quilt! Love the quilt, what a great pattern! Excellent fabric too, have been so looking forward to Brrr! The mix of colors is great. My eye doesn’t focus on one particular area which I think is refreshing. Excellent Job! Thx for the giveaway! I love all that you share…this quilt is lovely! I hope I win this gorgeous fabric! Your quilt is just amazing! I love it! Hope I win – it’s an amazing giveaway! You have some amazing quilting going there! Great job! And I can’t wait to get my hands on some of that Brrrr! This quilt is beautiful, Ashley!! Love the pattern and the texture! Seeing your quilting makes me want to try something different too. Thanks for the giveaway! Love those colors!!! Thanks for the chance to win them! Looks like some great fabric. I’d love to win! Your quilt is wonderful. I LOVE these fabrics – SOOO CUTE!! I also LOVE the Converging Corners design and it’s on my to do list of quilts! Thanks for hosting another fun giveaway! I love your quilt…and the fabric bundle is soooo prettttyyyy! I think those polar bears are adorable! Loving the flower quilting pattern that you used on this quilt! I’ve never seen it before! Your floral design is so cute on this! And I’m in love with converging corners- so beautiful. Thanks for the chance and especially for the inspiration! OMG Laura’s new fabric line is simply BEAUTIFUL!!!! Love what you did with it!! Lovin the polar bears! Thanks for the chance! Your quilt is lovely! And I’d love to win! Love those colors! Great fabrics! What an impressive quilt. I love how the white space really highlights the piecing. Also love the flower quilting. Thanks for the chance to win! love the backing and the quilting! Incredibly creative quilt! and who doesn’t love a polar bear? Your quilting turned out beautifully!! I love the quilt – who can resist those adorable polar bears? Love the quilting, always looking for new ideas. Thanks for the chance to win. I love Laurie and her fabrics!!! I love this fabric and such a fabulous quilt! Thanks for the chance to win! Great fabrics! I am looking forward to Angela’s book. It’s on my Amazon Wish List! Another beautiful quilt. I love the polar bears. Thank you for all the great inspiration and giveaway. These are beautiful! What a wonderful giveaway! I love, love, love this quilt!!! It really must be my favorite. The design is so fresh and modern. That you did one giant converging corners on the back just enhances this quilt as a whole. Thanks for the tutorial. I really should try making this quilt. It definitely goes on my to do wish list. A little fabric giveaway is icing on this post! That’s a stack of fabrics that would be quite fun to be surrounded with for a quilting project. But it’s your quilt that is the star of this post for me! This is super lovely! I adore the pattern and having some beemates make this for me. Thanks for the giveaway. That quite is really different. I love it! I also love the fabric giveaway 😉 Red and aqua-yummy! This is such a wonderful quilt! I hope I have the time to try and make it myself some day. Love the polar bears! I’ve been wanting this line since I saw it in her Etsy store! Thanks! I love the polar bears – they’re so charming. And I love how you utilized them! I can’t wait for this new book. Thanks to share with us! The quilt is lovely, but the quilting is even more striking! Thanks for the giveaway. Beautiful quilt. I love this fabric line too! This fabric would be so much fun to use in a quilt or my daughter. Thank you for the chance to win some. Beautiful! I’m also growing tired of the meandering stitch, and thinking about trying new free motion patterns. I’ll have to check out that book! Thanks for the inspiration! Yes. Yes,I would like to win those. ooh! would love to win!!!! Love the kona snow? Super fun quilt!! I must say, I’m smitten with those bears. Thanks for the heads up on the Free Motion Quilting book. I’ve been eyeing Brrr! for a long time now! That is a fun quilt! I’d love to win this bundle! I love what you’ve done with this quilt! The use of other fabrics really does make this more year-round. Oh how I love those polar bears! What a cute line of fabric. Thanks for the chance! I love all things Christmas! Thanks for the chance to win… And thanks for a great quilt tute! yes!!! I would totally love to win these fabrics. That’d be awesome. I love this quilt. I saw the tutorial you posted not long ago and ever since have been dying to try one. love this! i’m planning on using your tutorial, too, to make my brother a wedding quilt! I love your quilt…thanks for the giveaway!! Oh my, your quilt is spectacular! Thanks for the opportunity to own these fabrics. Oh, oh, oh, I love this fabric so I have to try! Thanks for a chance to win! These converging corners really call out to me. I imagine I’ll be making something with them soon! What a lovely quilt, and a great giveaway. Thanks for the chance and good luck everyone! Ashley, I am in love wit this quilt, those fabrics are too cute!!! The quilting is awesome! Another great one for you girl!!! Beautiful fabrics! I would sew and sew! I enjoy your quilts and visit often. I love the flower quilting–very inspiring! Gorgeous quilt! Now I want Angela’s book. Thanks for the drawing. Love the fabrics, and would love to win! Love your quilts – you inspired me to start quilting!! So now I need to build my stash!! Like the quilt and the quilting. Nice job. Fun pattern. Thanks. i love your quilts so much! thank you for the giveaway! the quilting is great! YAY POLAR BEARS! Beautiful quilt! I have enjoyed seeing all the different quilts made with this collection. Thank you! I love the back as one large block. Great lookin’ quilt. I love these polar bears! What a fantastic quilt! I love the colors and the pattern. I love converging corners and this line would be perfect for it! Those bears are so cute. I have two baby quilts to make at the moment and they would be the perfect fabrics! So beautiful! Love the fabric. The colors + the polar bears = oh my! Love what you did with the quilting too! Very cute quilt and very cute fabric bundle! Thanks for the giveaway chance. Oooooohh!! Love all the eye candy 😀 Brrr! is a great line, thanks for the opportunity! I love this quilt and fabric! My sister and I have been talking about a quiltalong between the two of us using your tutorial! Thanks for the chance to win. Love this quilt. The white ‘background’ sharpens the pattern. Your quilting is superb. I would love to someday make this quilt–if I ever complete the log cabin I’ve been working on for more than 6 years!!! I love the Brr line of fabrics so I have to enter the giveaway. Your quilt back is my favorite – I love it a lot! Ooooo I could really use some new fabric right now!! The quilt is beautiful!! Your quilt is beautiful! I would love a chance to win fabric, thanks! Oh how I love those bears!!! Took me a moment to understand the Converging Corners Quilt, but now that I do, I want to make one! I’d love a chance to win Brrr! 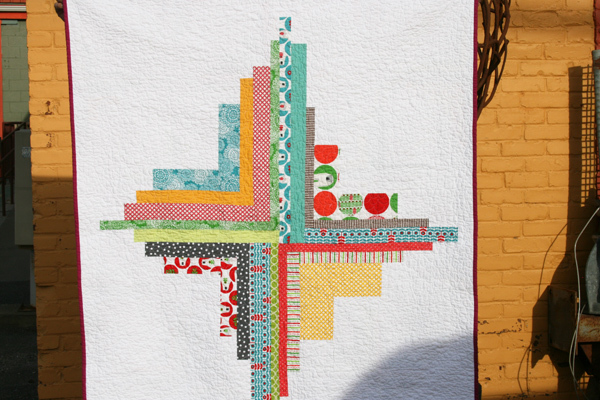 You quilt is fabulous – one of my favorite modern quilts. Thanks for the giveaway. What great friends you have. I’m working on one of these myself right now! Thanks and count me in! Love your quilt! Quiet but effective! That’s actually the campaign slogan for one of our local politicians! I think it’s more appropriate for your quilt! i love that the prints are wintery without being tied to a holiday theme. also, the red/turqoise combo reminds me of an outfit i wore in jr high!!!! I would love to win these polar bears…they are so cute! And I really like that converging corner pattern. Very neat. I LOVE the back, too. I am so in love with those polar bears, too. I love this pattern, I think I will make one of the wedding quilts I want to give this year from it. Thanks for the giveaway! Your quilt is so beautiful and perfect with this fabric line! Thanks for the chance to win! Beautiful quilt. This is definitely one of my favorites. Love the quilting you did on it too! I love the polar bears but even more I love the Converging Corners quilt block….in fact I have some Erin Michaels Uptown birds and I am thinking of using them in my converging corners quilt. Thanks for the ontest! Gorgeous quilt & fab giveaway thanks! I would love to win the fabric. The bear is just so cute and would basically look cute in whatever is sewn up. Thanks for the giveaway, it just makes life more fun. Of course I’d love to win. Thanks for the chance. This quilt pattern is one of my favorites. It looks great in all the different fabric lines. Wonderful job. And I just love the quilting you did. Love this fabric and the way you featured it in this quilt. What a great looking quilt Converging Corners is, very unique pattern. Fabric choice is wonderful, would love to win some. I love the quilting on this quilt! I’ve been trying to think of a design I could do freehand on the longarm for my red and aqua quilt and something like this might just do the trick! Lovely fabrics and very generous giveaway! Thanks! I must say, I would absolutely love to win that cute little bundle of fabric! What a great quilt! I need to make a cute wintery quilt, this fabric would be perfect. I love this quilt! Thank you so much for teh extra deals about your quilting! Thanks for the chance to win those fun fabrics! Your quilting makes me want to try some free-motion (I am a hand-quilter by nature). Brrr! would make an adorable quilt for a little boy i know :-))) Thank you for the chance to win! I love your quilt! And thanks for the chance to win. I`d love to make a winter quilt for my kids with the fabric. Thanks for your awesome blog, you make my day with your quilts and that cute boy of yours!! Polar bears rock! Thanks for the chance to win. The quilt is gorgeous! Love the quilt and enjoy reading your blog. Would I ever! I cannot resist those polar bears! Darling Quilt! Thank you for a chance to win. Great quilt and the Converging corners is on my list, great way to show off quilting” Thanks for the giveaway! Thank you for the chance to win these WONDERFUL fabrics! I love anything Laurie Wisbrun has to offer. I just love this quilt and all its colors! So pretty. Thanks for the giveaway. Great quilt! I have seen so many great quilts made from this fabric, I need to hunt some down! I adore that quilting pattern! I never would have thought of that. I think I’ll be adding the Free Motion Quilting book to my stash soon. I have been a straight line quilter for so long but want so badly to break out of that rut. Lovelovelove those polar bears! Thanks for the chance! Your quilts are always so I inspiring, I also love the back. I think I’ve reached my fabric quota for awhile but Brrrr is one I’m willing to make an exception for. My son was born in December and I’m already planning his polar bear themed 1st birthday party! Love this quilt! So much so, that my bee group is making it for me this month. And Laurie, she’s amazing. I have llook llamas waiting for me to do something with it. I’d love to make a Christmas quilt and actually get done by Christmas! I can’t wait to get my hands on this line! I’m a big fan of polar bears. Great job on the quilt! I love your quilt! I also love the simple colors of the Brrr line! Very nice quilt,love the polar bears! I will have to check out Angela’s book. I just love this quilt!!! Do you have a tutorial for this block?? I would love to try it! The flower quilting is great. I’ve been looking for more quilting patterns to try. Thanks for a fun giveaway! Your Converging Corners quilt is fabulous! Love it! I can’t wait to get my hands on Brr. I am sooo missing pics of your Max…he’s so darn cute! Fun fabric! And the book sounds great too! 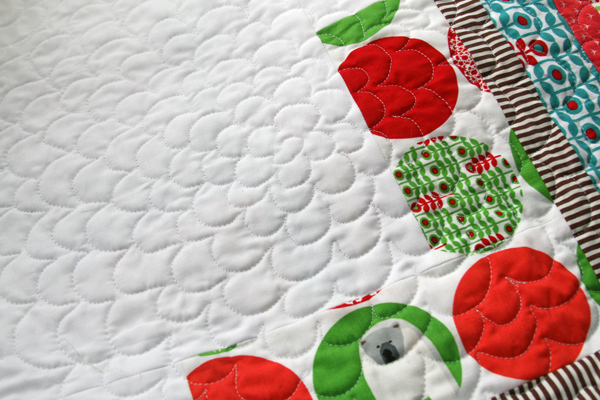 Love the quilting you did on that quilt – it’s so different and fresh. 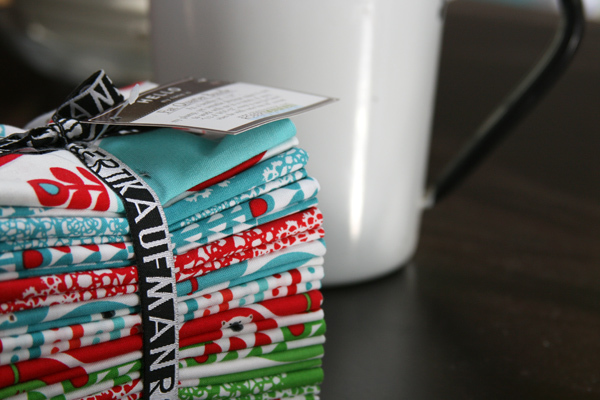 Thanks for hosting the giveaway – what fun I could have with that bundle o’ fabric! That quilt is great. I love all the open space for quilting in. Would love the chance to have some Brr for a winter quilt. How exciting! I would love to win these! They are so fun! What a great winter quilt (without having to put it away on January 1st!). Really nice quilt; I LOVE these fabrics; I’ve been waiting for them to be released! Thanks for chance to win! I love Laurie Wisburn!!! I just made my new son a quilt with pooches and pick ups. Ooh, please enter me in the giveaway! Lovely quilt. I love how you constructed it! Thanks for the giveaway, too! I looooove Laurie Wisbrun… count me in! So inspiring! Thanks also for the chance to win! I just love, love your quilt and I just love, love this fabric. I first saw it last week I think and it was love at first sight. Thank you for the chance to win it!!! This is such a fun fabric line! I would LOVE to create with it, THANKS for the chance! Thanks for showing a close up of the quilting. I am just learning FMQ and I love the chrysanthemum pattern echoing out. Inspires me to come up with something along the lines. Cool quilt and lovely fabrics. Thanks for the giveaway. Beautiful quilt! I love Laurie’s fabrics – and thanks for the mini-preview of Angela Walter’s book. This is such a lovely quilt; pretty fabric and great pattern. Thanks for the tutorial. I love this quilt! I’ve been looking for a pattern to try to dive into modern quilting and this is the one I picked. And I think I am a natural for winning this fat quarter bundle. Why??? Because my last name is Winter! I’ve been in love with this fabric the moment I saw it ! I’d love to win 🙂 And you made a really gorgeous quilt out of it ! Would love to win this bundle! Laurie’s designs, as are yours, are so inspiring! Love this bundle, would love even more to win 🙂 I love your quilts, I want to make a few of them myself! Pretty please pick me! I am in LOVE with those cute polar bears! I am in love with your converging corners and also with this fabric line! Thanks for the chance to win! Laurie Wisbrun doesn’t design anything I don’t like! I’ll definitely have to check out the book. I’ve been very hesitant with the free motion quilting … still practicing and trying to get the continuous speed thing right. Your quilt is really cute! Wow! That is one cool looking quilt — no pun intended! Beautiful fabrics, and I especially like what you did with them in your Converging Corners quilt! Thank you for the opportunity to win! Beautiful quilt! I love the polar bears! Looks like a great new line! Thanks for the chance to win! What a great quilt, and a great collection of fabrics! Love those fabrics! I hope I win! Love this quilt… I’ve put it on my list of hopeful somedays 🙂 Thanks for the great giveaway! You know, I’ve only ever seen polar bears in 80-degree San Diego zoo weather, so the “multi-season” quilt above seems very appropriate to me! Love the fabric, I’ve got this quit bookmarked. I’d really like to try it!! I just love your quilt tut. I have wanted to try this every since I saw it on your blog! Hopefully, I’ll have some Brr! to make it with (wink)! 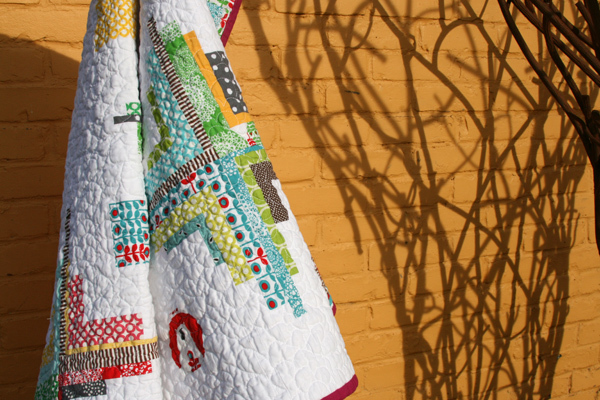 Your quilt is just beautiful and I would certainly love to win a FQ bundle of Laurie Wishburn. She is such a talented designer. would love the chance to win! thank you! I could do so much! i love your work too! oh, this quilt is just STUNNING! Lovely lovely lovely!!! And Brrr! is SO cute! I can’t believe I’ve not picked any of this up yet! Love the colors, love the polar bears, just adorable! I love those fabrics. I could see a great quilt coming from those. I would love to win this bundle of fabrics. I really like your Converging Corners quilt and made a few blocks for myself before I had to put it on hold to work on some things that need to get done. What a wonderful quilt. Thanks for the chance to win. Great design! I just might try converging corners for my next quilt. This quilt is so eye-catching. I love the use of the negative space to create the design. Love the quilt and the fabric. Thanks for the giveaway! Great quilt! I love your work! And how can you be so fast patchworking and quilting?? Please call me in! I love your quilt and I love that fabric! I love the pattern, and love the polar bears! I’ve been meaning to start a Converging Corners quilt – I need a new summer quilt for my bed. I’d love to include Laurie’s new fabric. I love that quilt and the fabric! I love this quilt design- I’ve never seen it before. Great job! What a beautiful quilt! What insanely gorgeous quilting! And what a handsome bundle! Very cute and I love your quilting! Thanks for the chance at the bundle. Wow! Another stunning quilt!! Loving those polar bears…fingers crossed! Not sure I’d find any polar bears in Zambia, either…but I’d love to put some on a quilt for our coming cold season! Love how it turned out! Beautiful. And thanks for the giveaway opportunity. I would love to quilt the same quilt – it is so beautiful! I’d love to have this line! Your quilt is pretty and so different. love this quilt. such an interesting idea! really admire your ability to put these designs together. love all of Laurie’s fabric lines, always so fun and cheerful. Lovely colors and nice to see how wintery fabrics can be used. I would love these so much! I am just smitten with the aqua and red polar bears! Ooh, I need the red and turquoise! Those bears are just too cute. And I love the quilting pattern. I may have to start branching out from my loop-de-loos. Thanks for the chance! It looks so fresh with the white! I cleaned out the craft room and have been sewing again, would love to work with these fabrics! LOVE your quilt! I love Laurie’s fabric, I don’t think there is a line that I haven’t drooled over! Thanks for the giveaway! love the original design of this quilt. Thanks for the chance to win some Laurie Wisbrun fabrics. those bears are the best yet! And aqua with red is so much fun. What a great, fun quilt! Not wonky, but still leaves room for creativity and improvisation! Love the fabric, too! Always love your quilt designs and the converging corners in one I have on my “to do” list. Thanks for the chance to win the gorgeous fabric. I really should stop signing up for giveaways since it would almost be easier to win the lottery than win something from your site! 🙂 But, these fabrics are so cute, I’ll try again! I sure wonder how you get so much quilting accomplished. Quite impressive! The polar bears are so cute! I think this is a wonderful wintery collection without being too “Fa la la la la”. 😉 Your converging corners pattern is also fantastic and I am hoping to try it out soon. Love the converging corners quilt! Thanks for the chance. Love both sides of the quilt (as usual). LOVE the fabric – it’s adorable! I love your quilt. I added as a favorite on my fickr account. I really need to try that pattern. I Love the way it looks! What fun! I would love to win some fabric to motivate me to quilt again ( I have taken a break since having my son) and as always, looking at your site gives me inspiration! That is a really cool pattern. Thanks for the giveaway! Oh how I love the seeming freedom of your quilt & the colors of your give away. Thank you for the chance to win! I love this quilt! I think I would love to try to make my own version of this one too. OK, it’s on the to do list! Thanks for the tutorial and for the chance to win some of Laurie’s fabric too. I love your quilt! So beautiful. Thanks for the give-away! What a wonderful quilt, I would love to make one myself. What great colors and a beautiful quilt. Lovely fabric and therefore fingers crossed!!!!! gorgeous quilt and the giveway fabric is fantastic!!! my fingers are crossed. love your quilt! thanks for the giveaway!! Love your quilt. I too am awaiting Angela’s book. Thanks for the giveaway. I have been loving these fabrics ever since I saw them, and am so grateful for the chance to win! Thank you! I love this quilt! And I think I like the back even better than the front. Would love to have some of that cute fabric! Oh, it’d make such cute wintry decor! The fussy cut polar bears are great. Thanks for the giveaway. I like the back better than the front, but I still adore the front. I would love to win the new fabric. Thanks for the chance to win. Love all your quilts but this one just might be my favorite. Thanks for the giveaway. Beautiful quilt! I love how much white you used. Would love to win! That’s a great quilt design. I love how the back looks too. Thanks for the chance to win some of Laurie’s cute fabric. Polar bears….I love them. Also that quilt is one of my favourites of yours ever! I love love love love this quilt. I have bookmarked your tutorial and I can’t wait to use it. i am counting down for this line…i love laurie’s designs! Love this quilt and I love this fabric! Gret job. Thanks for another great giveaway! I love your quilts and I also love Laurie’s fabric (esp this line), so I would love to win! Your quilt is gorgeous. I love the fabrics. Thanks for the giveaway!! Your quilt is darling and I’d love to win the fabric! Love the front AND the back. Just learning to free motion quilt in a class at my local quilt shop. Your blog is most inspiring! Love this converging corners quilt, can’t wait to try one myself! Thanks for the tutorial a few days ago. Oh how cool. Love the polar bears! Love these fabrics. Thanks for the chance to win them! I love the back!!!! Of course the front is breathtaking too. Thanks for the giveaway. Fabulous quilt~ you are one talented lady!! And thanks for the chance to win! Love the front and the back of your quilt. And the quilting. And the fabric. Love it all! That’s a really clever quilt design. Thanks for the give-away. I’ve got my fingers crossed. Love the quilt, especially the back!! Thanks for the giveaway! Beautiful quilt…I love the quilting design! Would love a chance at these fabrics to try my own 🙂 thanks for all the inspiration! I absolutely love your converging corners design. I’ve never seen anything like it before. And, I would love to work with those adorable polar bears. I love the converging corners. And thank you for posting a giveaway. Oh my goodness…I love this quilt and I love these fabrics. Thank you!!! Love the quilt, and I’d love that fat quarter pack!! Love this quilt and so much that I used your tutorial at our first Bulkley Valley Modern Quilt Guild “Quilt In” on Feb. 25th. I blogged about how it turned out and its on my Flickr account. Great new block! I’d love to win these fabrics too! You make such great quilts. Love this design so I bookmarked it in my to do list. Thanks for sharing your creativity. What a beautiful quilt! Thanks for the chance at the giveaway! Wow, great quilt and it seems very popular fabric! I love those cute bears! Beautiful quilt – love how it turned out. Thanks for the chance to win some wonderful fabric. Thanks. Ohmygoodness ohmygoodness! I love me some polar bears! I’m really loving that fabric and have some little boys in my life who would get some seriously cute stuff made from it. Fingers crossed! Thanks for the hope! Thanks! I’d love to win! these polar bears are so adorable. i love the look you lent them with this quilt. oh this turned out so great in the quilting! and I am torn too as to which I like better, the front or back. Please enter me to win this great pack so I can make a run at your quilt back. I love the way you did a combo of fussy cut and straight. Even tho’ we are into the blooming season already a quilt with polar bears always seems to be a great idea. Eek! I love the quilt…front, back and quilting. And oh my goodness about the giveaway. This is one I’d really like to win. Beautiful fabric — both in the quilt and the giveaway! Awesome quilt design and LOVE the polar bear prints! Keeping my fingers crossed. These fabrics are polarizing beautiful, fun and will be chilling to work with. The finished quilt is lovely. Thanks for the chance to win. I am a wee bit jealous of your quilting pattern. I am not on such great terms with my walking foot! Love the bundle of Brr! yes please, your quilt looks great! Love this quilt and fabric! Thanks for sharing it with us. That quilt is beautiful and so different from everything else I’ve seen using this line. I love it. Just gorgeous. beautiful! Sign me up, please! What gorgeous polar bears – hope I win! love the quilt, all those white spaces with the colours in between. Love the polar bears and the fabric line, and love that you’re always up for a new technique such as changing your quilting. Very brave and self-challenging of you. I love how you showcased the polar bears without it being overly wintery. Beautiful! Oh! yes please!!!! I’d love to have some polar bears! Wow, what a great give away! Thank you. And your quilt is gorgeous! Yeah. I don’t have polar bears in my stash. Love the boldness of color in the quilt. Just the right amount of white space. Love all your quilts! Love the polar bears!! I love what you did with this fabric and would never have seen it as non holiday themed without this quilt. I would love to win a set of this fabric! Love the polar bears, so cute! And it’s such an interesting and creative quilt! Your quilt is really extraordinary and very inspiring. I have made 3 Log Cabin quilt and are looking for something new, a new twist on the logs. Such a fun quilt and great quilting! Love your quilt and the fabric, need to put this on my to do list. Such a fun quilt, and super cute fabric! Fbaulous quilt! I love your converging corners pattern! Oh I love that FMQ design. I just got a new sewing machine (Bernina 440QE) so am going to teach myself FMQing. So excited, I might even start with this design. Those look great! Thanks for the chance! How fun! I would love a chance to win!!! Even with the # of entries already here, it never hurts to try. And I love that quilt. I want to make one myself. Love your quilt. Would love to play with it myself. I love these fabrics! And everytime I’m on this site, I seem to add another design to my to-quilt list. What a fantastic quilt! I am in a quilt group and we are in the process of making a quilt for an auction. This may have to be the next auction quilt idea. Thanks for the opportunity to win! So cute! Lots of entries all ready but you can’t win if you don’t try right? 🙂 Great quilt, cute fabric, thanks for the giveaway! Very “cool”….thanks fore giveaway. Love the way your brain works! 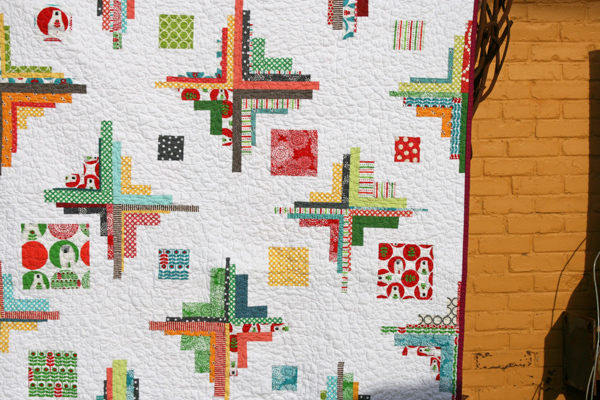 Your free-motion quilting is amazing! Thanks for a chance at the giveaway. Your quilt is very pretty.I like the quilting, looks pretty darn good. I love this quilt and the colours in Laurie’s Brrr fabrics. Oh my! Thanks for the chance: I just love those polar bears! Beautiful! I’ve been wanting to make a winter themed quilt for years! How exciting! I have been completely enamoured with this fabric since I first laid eyes on it. Great quilt! Beautiful quilt! And I love the fabric… it is fun and festive! Ashley, I love your blog and your quilts! Converging Corners is another winner. I’m making “Windmill Whimsy” right now as a baby boy gift. Thanks for all you share with us. The quilt is beautiful! Thanks for the giveaway! Great quilt! Where’s Max? I miss his cute little face … Thank you for the giveaway!! Love polar bears!! Love the quilt! I love this quilt and your use of white. It gives it a crisp, fresh look. Keep up the beautiful work. This fabric would be fun to use. Thanks for the chance to win! 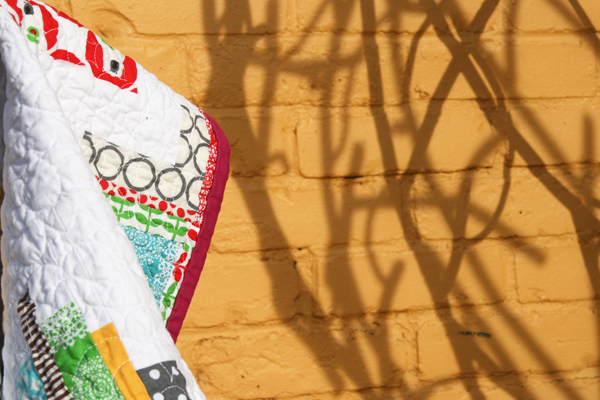 Oh my goodness, your quilt and the Brr fabrics are to die for! Thanks for the chance to win. What you don’t have a polar bear farm around close. Yeah, me either, but with that polar bear fabric I guess you can have one in your own home! I would love to make a polar bear/ winter quilt; pick me, pick me! As, always thank you for sharing your wonderful-inspiring quilts. I love that quilt! Can’t wait to do the tutorial. I love the colors in this quilt and the design reminds me of snowflakes. Thanks for the giveaway! love the colors….and its a great quilt design too! Ooh I love the quilting almost as much as the quilt! And thanks for the heads up about Angela’s new book – I think that will be a must have! Yowzaa..you have some mad skillz there with the quilting. I am so intimidated to try something like that after all the work of producing the quilt top. Which by the by I love yours. I’ve gotta find some courage and just go for it. I love your quilt and I love this fabric! Love your quilt and the fabric! The quilt is absolutely gorgeous. It would be great to win your giveaway. Thanks for the opportunity. Love the fabric and your quilt. Thanks for a chance at the giveaway. i really love quilt backs. they are the best part! Awesome quilt! It really catches your eye. I think this is my favorite quilt of yours to date! absolutely lovely and stunning! I love the big flowers and am almost relieved to hear that some of the quilting gets lost after a wash. That means it’s okay if I mess up a little bit! Beautiful quilt! Beautiful quilt…and I would love to win the fabric! I love this quilt! Brrr is so cute and makes and bright, colorful quilt. I love how the squares are different sizes. Absolutely FABULOUS giveaway!!! THANKS for the chance!! WHAT a gorgeous quilt! Wow! I love those fabrics! Thanks for the chance to win some! Love that quilt. Looks like it might work well for a scrap quilt. And goodness knows I have more of those than I know what to do with them. Ooh lovely! And I like how you quilted it – looks great. Thanks for the chance! I would love to win that fabric bundle – and I can’t wait to try out that quilt pattern, and I would really like to see the new machine quqilting book – I too am getting bored with stippling, but have just not been brave enough yet, or creative enough, to try something else. Thanks for the inspiration! Perhaps you’ve heard this a time or two, but it bears repeating…LOVE THIS QUILT!!!! Pure genius it is, I tell you! Oh my gosh – those fabrics are adorable! As is your converging corners quilt! I love the way you quilted it. Thanks for the giveaway! Great quilt, great fabrics, great giveaway. Thanks! Oh, I am DYING to win! Those fabrics look absolutely delicious! It’s amazing as always Ashley! Thanks for sharing! Love these fabrics…. would love to win! Love the converging corners idea. I would love to have a good eye like yours – you can envision it and it looks amazing when you are done! My favorite thing about these fabrics is the light blue color!! Maybe I’m just reallllllly ready for the blue skies of spring?! Oh! I’d love a chance to win these! What fun fabrics! I love what you did with them. I am going to have to try out that pattern. I agree, I love the back! Thanks for the giveaway. I need to make this quilt! I often like the backs my quilts better too! Thanks for the chance. what a fun quilt….thanks for sharing your work! I’ve literally had dreams about this quilt and can’t wait to start one of my own. My sister is quite obsessed with polar bears. It would be so fun to win and make a quilt with these fabrics for her! Your free motion quilting is lovely, I’ll have to try that design sometime. Wonderful colors!!! Love this quilt and yes I would love to win these fabrics!! love! love! love! your quilts! Would so like to sew up something with brrrrr. ps I live in northern Canada! really love this quilt – simple but very effective!! Fabrics look fantastic together! And I think the quilting looks great, too! Thanks for the chance to win. Love that huge block on the back!! Thanks for the chance to win! Ashley, How do you get so much done?! Lovely quilts always and fabrics. Thanks for the chance to win some great fabric. I love R. Kaufman fabrics! I just LOVE the quilting pattern on this! I so love these quilts and would love to get some of the Brr fabric! Thanks for the chance! I really like this quilt! Also, can’t wait for that quilting book to be available!! I love this quilt! I would have to “take turns” with having each side up; both are equally appealing! Thanks for the chance to win the fabrics! I love these fabrics, thanks for the chance to win some 🙂 I also love that pattern. I love your quilt! And I think the front & back are equally gorgeous. I’m planning to make a converging corners quilt with your lovely tutorial, it’s such a great pattern. Thanks for sharing & for this amazing giveaway. Great quilt and giveaway! Love the texture of the quilting! I really enjoy your blog and your quilts are gorgeous! The quilt is wonderful like yours other too!! That quilt is very cute. I like the front, but I love the back of the quilt!! Lovely colours. I have a thing about green and red together, but lately more light blues seem to jump right in in the mix. Absolutely lovely. love you quilt. I love this quilt so much! Just wonderful. The fabrics are lovely, thanks for the chance to win! I just love this quilt, and am anxiously awaiting the release of Brrr! I’d love to have some. Thanks for the chance to win some. Love the fun design and fresh colors on this quilt and my daughter would love something made with those sweet polar bears! Thanks for the opportunity! Great fun. I like the randomness of the front especially. Love love the quilt :). The fabrics look wonderful too. Want it so much:)) I would love to win! thanks! Great pattern. I’ve often wondered about doing a big block for the back to echo the front. Looks great more two sided than front and back. Just finished the blocks for a converging corners quilt and look forward to laying it out. … LOve what you did on the back! Love the fabric and the quilt! fingers crossed that I’ll get lucky for once! How nice of you and Laurie. These designs are great! A fun quilt is guaranteed, don’t you think? This quilt is a happy feeling quilt for me & it’s so pretty! Thank you for the chance to win some fabrics & I love to see all the creations on your blog site! I would love to win, have been eyeing this line since it started showing up on the internet! Thanks for the chance! Yes and Yes, I would love to have the new RK line. And, once again, you have created a fabulous quilt. Such cute fabric. I do love the flower quilting motif you used. I’d like to try that on a small scale. Love this fabric! Can’t wait for it to come out. Yummy fresh fabrics in an absolutely beautiful quilt! What’s not to love??? Love this quilt. I like the turquoises and reds together. what a fun quilt, you are such an inspiration, thanks for chance to win, oh and I am so looking forward to getting my hands on Angela’s book too. Love the quilting. This would be great as I can’t chose colours to save my life. Thanks. You and Laurie have made a great team of late! I’m saving my pennies for llamas and would love to win the Brrr…my daughters are crazy for those bears! i just adore these polar bears! so many great projects popping up on the net! Lovely lovely quilt and what gorgeous fabrics. Thanks for the chance. Beautiful quilt.And a great giveaway. Wow, very lovely and great quilting! Thanks so much! “gotta try this” the first time you posted. Brr I would love to win this gorgeous fabric … Please . Love the Polar bears the best. Wisburn’s fabrics always play, even before they end up in a project;I’d love to have the ability to let these fabrics swim, slide, and run circles around the design board to see what pops up! I love your converging corners quilts – such a clever way of putting it together and it looks great! Love the quilt, love the fabric line! I do love the converging corners quilt block. I too LOVE the huge converging corner you did for the back! Gorgeous! The clamshell quilting looks fabulous and the quilt turned out awesome+. One of my bee partners has picked this pattern for her month and we were reading about it just yesterday. It’s going to look so cute. As for the Brrr fabric, well…I can’t wait to get my hands on that. So many ideas percolating for it. Great quiilt! I have no clue how you create so many fabulous quilts and so quickly! The giveaway fabrics are fun, I love the polar bears! Great quilt made with great fabric. And to top it off, a chance to win some super great fabric. What a good day! The colors are great on the quilt. Love that you made something with wintery colors for year round. That’s always the challenge. Great quilt — always inspiring to see your work!!. I don’t know how you manage to get so many quilts made with a small baby. I love the converging corners! And of course I’d love that beautiful bundle of fabric!!!! Love the quilt and love the fabrics! I love those polar bears – and the way you used the circles! Beautiful quilt! Just beautiful as usual! I like all the white, giving a snowy feel to go along with those polar bears. I love the back too — what a great quilt! Very successful quilt and fun fabric. I love your quilt and the back is wonderful!! Brrr! Looks like a cute line. I really like the red and aqua together. I wish I could quilt as good as you! Love these cute fabrics- would make an awesome quilt for my daughter!! Love your quilt! WOW fat quarters of the whole line. I should be so lucky. Thanks for the chance to win. This quilt is amazing!! I would certainly love to work with those fabrics! There are so many possibilities! Wish me luck! I need to work on my free motion quilting so I’ll have to get Angela Walters’ book. Great fabrics–thanks for the giveaway! I’m loving quilts with white being the dominant color. It breaks me out of my comfort zone which is usually a quilt filled with bright colors. I love this! and the fabric is adorable. thanks for the giveaway! Amazing quilt ! Thank you for the chance to win. Love the flower quilting! Also love free stuff. . .
At first glance it looked like chopping and re aligning of blocks but wow its easier than I thought, thanks will definately be using that fabric line. Love your quilt and the great block! Thanks so much for the wonderful inspiration I can always find here. Of course, I would love to win the fabric! Thanks for the giveaway! Great fabric. Love the colors. Beautiful quilt! Thanks for the chance at a great giveaway! I love your quilts and would love to win your giveaway and I am missing pics of Max!!! I love this fabric. Thanks for inspiring so many people Ashley! At the rate it takes me to finish my quilts, I should be able to use this fabric for a perfect winter quilt. Just in time for winter too! Thanks for the giveaway! This is absolutely beautiful!!! I will have to add your quilt to my growing list of “Must Do”. I love the colors – bright and colorful – just right for such a quilt as this! I love those colors!!! and thanks for the chance to wins. Wonderful quilt and wonderful fabric! Nice quilt!! I would love to win the polar bear fabric!! Thanks, have a great day! Love this quilt and cannot wait for Brr! to come out! I love this quilt pattern–it is just so fresh! Beautiful quilt! I just love this fabric line. I love all your quilts! Iam new to quilting and have learned so much from following your blog. Thank you for a chance to win the fun fabric. Love the colors and the quilt. I was a very traditional quilter and am now convinced to change my ways to modern, they are more fun! Oh! The quilt is fantastic and the fabrics are wonderful. Thanks for the chance to win! Love the quilt and the quilting. The colors are gorgeous! What a treat to find your blog mail in my inbox this morning. I’m digging the quilting on your latest work. It looks like big zinnias, my favorite flowers. Hi! I’d love to win this fabric. I really like the quilt–quilting is something I still want to give a try! LOVE this block. I’m going to try it and so is my daughter in law. Thanks so much. Ohh this is quilt is fabulous. I truly love the back. And the free motion quilting makes it really makes it come alive. Love winter fabrics. It’s the main season we use quilts all over our house. Here in the north of Canada, you need some cool winter coziness. Love the fabrics, such great colors! I can’t wait for this line to come out!! I had and idea what I would do, but now I am thinking converging corner quilt! That quilt is beautiful. I love how you combine different colors and prints. Love the quilt, made my own version, first quilt I have ever made! Thanks for the great tutorial. Oh, I’d love to win…I adore those polar bears! I really love this quilt and the back has given me inspiration on how to finish the back of the quilt i am currently making. Love those bears and all of Laurie Wisbrun’s fabric! Thanks for sharing, and for the giveaway opp. Just about the time I think you have done the greatest quilt you come up with another one!! !Your quilting was a perfect curve with all of the lines in the peicing.I’m really loving the fact that either side could be back or frount.The polar bears are also very cute and not over done.Once again a perfect merge! !Looking forward to the next one!!! I love the converging corners design! I am having difficulty deciding if I want to do this pattern or a string quilt. You have great tutorial! Thanks for sharing! Oh my goodness, I would love to win this! Definitely it would make its way into a quilt for my son. The characters would delight him! Your converging corners tutorial is in my stack of “must try” quilt ideas, and I know what you mean about happy surprises with quilt backings. Thanks for the great ideas and the great give-away! I love the converging corners quilt, thanks for the chance to win. Gorgeous quilt!! Thank you for the chance, that fabric is gorgeous!!!!!!!! Love that collection – and the quilt – Awesome!!! I love the quilt & the design. Thanks for the chance to win!!!! such a fun and unique quilt! I’d love it! Ooo la la – that is one gorgeous quilt. Thanks for a chance to win! What a gorgeous quilt! Thank you for the opportunity to win these fabrics. your quilt is like a sun! Love the way you use colours! Your quilts are gorgeous and inspiring! Thanks for the giveaway chance. I am in awe of what you do! I am a newbie, struggling with the basics. Somedays I just sit and stare at my fabric, dreaming about what I could do with all the pretty colors! I love your converging corners quilt and your tute is easy to follow – thanks for posting it! Sign me up for the generous giveaway please, I’d love to win it! Awesome! I love the quilt and I love the new fabrics! So beautiful! I love the design and the color! I’d love to win the fabric bundle and make this quilt. Wow great giveaway! I’ve fallen in love with the polar bears! Thanks for the chance. I have always loved the way Laurie chooses her colors. Always a bit different from the norm. I’d love to win some of this fabric for some winter sewing. You always do such great things with Laurie’s fabric! I do love the construction of this quilt! I would love, LOVE, to win the bundle. The colors are just beautiful…as is your quilt. Just discovered your blog! You do amazing work. LOVE this quilt – love your use of color. I am new to quilting and you and your blog is an incredible inspiration. Thanks for sharing the quilt and for the giveaway! Gorgeous quilt! Love Laurie’s fabrics – the polar bears are cute and matching prints perfect. Clever combination of colours and designs. Love this line! The quilt is fantastic! love love love this! I can’t wait to try this pattern – and gulp- maybe the free motion quilting too! I love what you have done with this quilt. The colors are awesome. And I can definitely see Angela’s influence in the quilting. :-)) Well done. Such happy fabric! Lovely colours — who wouldn’t want to win this fab giveaway?! What a great quilt! I would love to win this fabric!! Thanks for the chance! Wow! this quilt is beautiful and I love the fabric! Thanks for the opportunity to win! Great collection! LOVE this design! Thanks for the opportunity to enter this giveaway, yeay for polar bears! I love this fabric!! I would love to win, thanks for the chance! Love the quilt with those terrific polar bears and that new quilting you tried is awesome! Your converging corners quilt turned out beautifully! 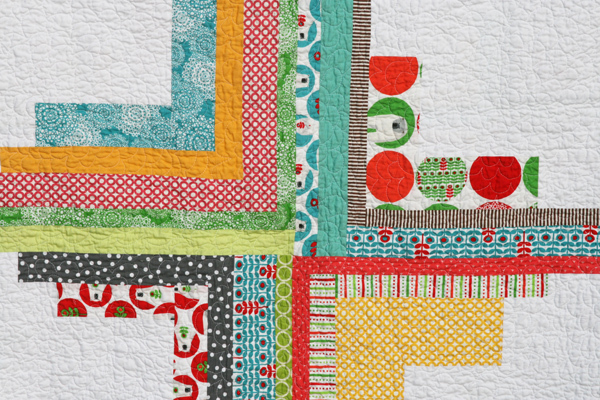 I love the quilting, too :o) It would be so much fun to have this sweet Brrr fat quarter bundle to play with. Your quilts truly are lovely and inspiring! And the fabric giveaway is nice too…..
Another beautiful quilt and another fab giveaway. Thank you. Beautiful quilt!! Thanks for the opportunity!! love it… you have such amazing quilts. Thank you so much for sharing! I love your quilts. I am in love with the converging corners!! Thanks for the giveaway. Love your newest quilt. You are such an inspiration! would love this fabric! and love the tutorial for converging corners! I just found your blog not too long ago. Love it. My sister and I are making a quilt together and your converging corners might be the perfect inspiration! This is my new favorite FITF quilt–truly fantastic! Loving the quilt and the fabric! I can imagine a nice winter quilt with this fabric! GORGEOUS quilt! And thanks for the new quilting motif idea– I love that and I need to branch out from stippling! Love your quilt! You really get them done so fast. I am totally impressed with your talent. I have loved Laurie’s fabrics since she was at Spoonflower. Her designs are beyond cute. I would love to win some please. Thanks for the great giveaway. Love this quilt! It’s so different…and I’m a sucker for lots of white space…I like how this one gives white center stage. I have been stalking this line all over blogland and your pattern is gorgeous! such great quilting. You’ve probably answered this question a million times but I couldn’t find it in old posts, what kind of sewing machine do you use? I have terrible luck with free form anything with my sewing machine (maybe because it is old enough to have graduated from college). Love your pattern and hope to make it in the near future ! Thanks for sharing it to the world ! I love the fabrics and I’s love to win. Wow, what a generous giveaway! They’re such pretty colours and I’m a sucker for red and aqua together. I love the quilt, especially the different-sized squares scattered throughout. Converging Corners is one of the coolest designs I’ve seen! I’d love to give it a try. Thanks for the great giveaway, too! Love your original design! And these polar bears would love to visit me in Hawaii!!! thank you for the giveaway! I just LOVE Lauries’ fabrics!!! I love the quilt and the fabric – would love to make one of my own. This is another wonderful quilt by you! I really love this one! I’m so glad you did a tutorial for the block. Thanks for the chance to win the great fabrics! Beautiful fabrics! I’d love to make a quilt with them. I love this quilt design. Thanks! Winning would be just plain nice 🙂 thanks! Would love to win these beautiful fabrics for a quilt. I love the red and aqua, and your corners quilt is so lovely! Good fortune! I was just browsing around for more pictures of kona solids and you’re having a giveway as WELL as awesome pictures of all your solids and the great quilts you’ve made. Thank you for the giveaway! I love your pattern, thanks for the tutorial. It’s on the short list of quilts to complete. I’d love to win the Brrr FQ pack! Your newest quilt is lovely and I enjoy seeing the many different ways that you photograph your work. I’m always up for free material, so decided to give it a try. I love this quilt! And your quilting design is terrific. I can’t wait until Brrrr! hits the stores – I love polar bears! Winning a bundle would be like having Christmas early! Wonderful quilt and fabric selection. I admire all of your work! Wow, I guess from the response you can see how much we like “Brrrr”‘ and you fabulous quilt. Both are stunning! Oo – sign me up too, please! As always, I love your quilt. Especially the back! Gorgeous quilt, I love the marimenko quilting too. I am so loving this quilting design. It’s inspiring me to go beyond my usual meandering and quilt some flowers for gosh sakes. Thanks! Your quilt is gorgegous!! Love the giveaway fabics too, colors so lush. Love it! And hope it’s a harbinger of a snowy winter next year here in VT.
That quilt is incredible. What a talent you have! I totally see the floral design in your quilting and love it! such a great quilt, and I love the quilting! I’d really like to learn more about free motion quilting, so it’s great to know there’s a book coming out soon! i would so very much love to win them! I love the colours in the bundle. Thanks for sharing! Love the quilt – so fresh and cheerful – and would love to win this adoreable fabric; thanks for the offer. Your quilts are an inspiration. Thank you for sharing them! Such a great quilt. I am inspired as always! Aww, the polar bears are beyond cute! I would love some of that fabric, thank you. I love the front but I think the back is my favourite! Thanks for the chance to win such gorgeous fabric. Just lovely! Thanks for the giveaway as well! Would love to win. Thanks for the inspiration your site always gives me! Beautiful quilt! Beautiful fabric too! Your new quilt is a lot of fun! Definitely makes you smile to see it! Thanks for the wonderful giveaway! Who wouldn’t want to adopt those bears?? It’s adorable, and great job on the quilting!